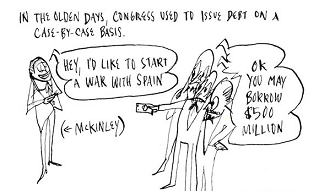 Everything you need to know—in cartoon form—about debt-ceiling fiascos, from McKinley’s war with Spain to Obama getting punk’d. This entry was posted in Crazy World of Politics by Larry Shivers. Bookmark the permalink.